Activate your Third Eye Chakra with this gemstone focal point and necklace set. “Blended Blues” help to relieve tension and encourages a clear, logical, and intuitive perspective. These gems allow peace, personal power, enlightenment, and understanding. They help you connect with ancient knowledge and bring guidance when making decisions. This set Includes: Tear Drop Sodalite pendant with 24” sterling silver figaro chain; Crystal glass bowl; Natural tumbled Sodalite and Lapis Lazuli gemstones. “Blended Blues” contains Sodalite and Lapis Lazuli gemstones. Together these blue gems stimulate insight, intuition, knowledge, and logic. Lapis Lazuli activates the higher mind and encourages understanding. This gemstone promotes self-awareness, dignity, compassion, and the desire for truth. Sodalite lifts self-esteem and activates intuition, it allows a logical perspective and aids in releasing old thought patterns. 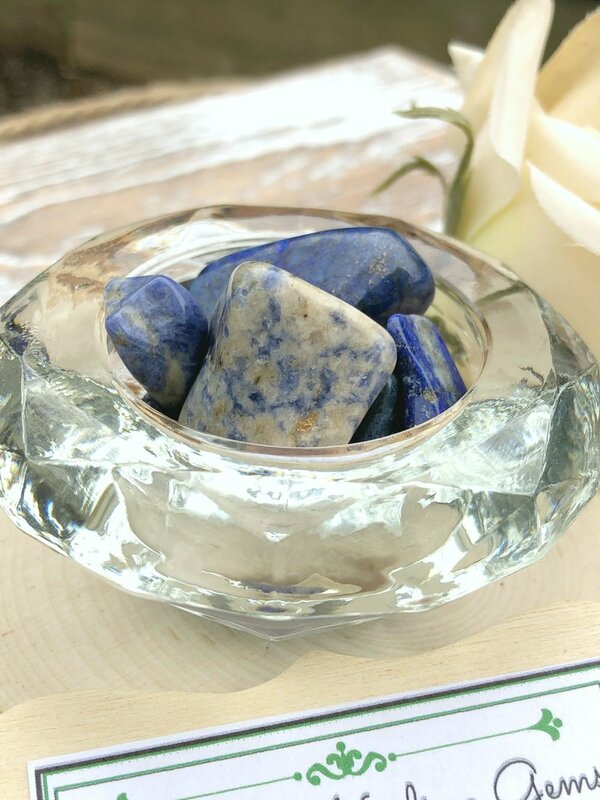 Clear your mind of confusion and bring balance to your Third Eye Chakra with these beautiful blue gemstones.